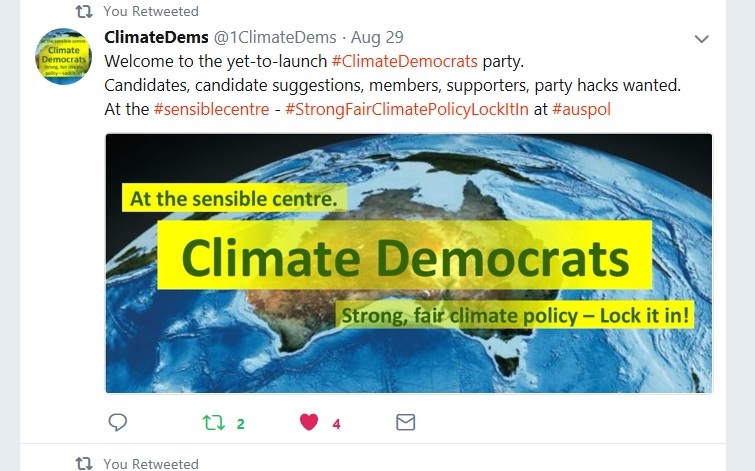 It appears a new political party – the Climate Democrats (CDs) – has entered the considerable vacuum in Australian politics left by the Liberal Party abandoning climate science and common sense. But it is not an easy task to fill and will take time, and an enormous amount of energy and support, as the litany of previous attempts clearly illustrates. By my reckoning this is the fifth attempt to create a single issue climate party in a little bit more than 10 years. The first was the Climate Change Coalition which disappeared in the Ruddslide followed by my own ineffectual attempts with the Global Warming Action Party Australia (my daughter joked that the acronym GWAPA sounded like a frog croaking). About 2010 the still unregistered Save the Planet Party (STP) started up in Victoria. Like other previous attempts the STP failed to garner much publicity and must be considered a left splinter of the Greens. The Renewable Energy Party (REP) was formed in 2016 but unfortunately carried a fair amount of political baggage with its founder Peter Breen. I joined the REP on its successful registration – previously I had been a member of the STP – and was one of a number of candidates in the 2016 election who lost their deposits. Like the Climate Coalition before them they had been banking on instant success – a most unrealistic proposition. After a long period of silence and inaction from the committee with one exception they all resigned, leaving a few individuals (including yours truly) trying to save something from the debacle. In this we were unsuccessful and the REP was deregistered earlier this year. There is a need to avoid the political baggage of the past if possible. There is a need for appealing across the political spectrum and in particular occupying the centre and the centre-right. The single issue climate change party should be challenging in the seats where the Greens (the only party with credible climate policies) have little or no sway. It is in these seats in the main held by Nationals and Liberals that the cancer of climate denialism is to be found. It is in these safe seats that the sitting members need to be threatened and made marginal. The party should be built up from a sound base with as little as possible individual ambition and no unrealistic expectations. So I wish the Climate Democrats well and hope that they succeed where those before them have failed. As it seems unlikely that they will be registered anytime soon in Gippsland I will be supporting Independents – any with credible climate policies or understanding – then the Greens and the ALP. I will also consider joining the CDs once I have given them a close inspection.